One of the most difficult choices a board makes when preparing an association’s annual budget is whether to increase assessments to fund the association’s reserve account, or to keep assessments low and delay funding the reserve account until a later day, if at all. The reasons boards may under fund reserves are varied. It may be as innocent as the reality that association is having difficulty collecting assessments and all the money collected is necessary to meet operating expenses, or it may be a misguided desire by the board to artificially keep assessments low in fear that the members will not support an increase in order to fund the reserve accounts. After all, it can be a so easy to make the choice to keep assessments low. Raising assessments, even if it is necessary to fund reserve accounts, is rarely a popular decision. It is much easier to put off funding the reserve account, keep assessments low and keep the members happy, at least in the short term. However, failing to properly fund reserves is rarely, if ever, a good decision for the board to make. While some boards rely on what is a technically accurate statement that associations in California are not legally required to fund reserve accounts that is a dangerous and often short sided understanding of reserve accounts, and their importance to the financial health of the association. Whatever the cause, failing to fund reserve accounts pursuant to a plan developed in conjunction with the reserve study can place the association’s financial health at risk. So much so, that the California Department of Real Estate recently took the extraordinary step of issuing a consumer warning for underfunded homeowners associations. Failing to properly fund reserve accounts results in a significantly increased likelihood of large special assessments, possibly in the thousands or tens of thousands of dollars to pay for necessary repairs. In addition, underfunded reserves can lead to lower property values within the association as buyers become wary of properties which are likely to be subject to large special assessments. Lastly, failing to properly fund reserves may make the properties in the community ineligible for federal loans issued by Freddie Mac and Fannie Mae, reducing the market of potential buyers, further reducing property values. While the DRE consumer warning is not the only reason that boards should take steps to ensure they are properly funding reserve accounts, it highlights the importance of doing so. The risks in failing to fund reserves are too great to be ignored. 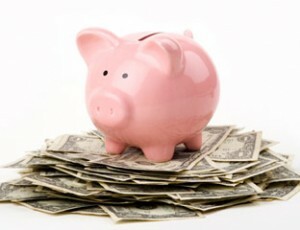 Boards should heed the DRE warning and use their best efforts to start properly funding that reserve account piggy bank. AB 2273 was signed into law by Governor Jerry Brown. The bill requires foreclosing parties to record a sale within 30 days of the sale. This will benefit associations since it now requires public notice as to who owns the property, and where they may be contacted so that associations can properly invoice all owners for assessments. AB 2273 has been signed into law by Governor Jerry Brown. The bill requires foreclosing parties to record a sale within 30 days of the sale. This will benefit associations since it now requires public notice as to who owns the property, and where they may be contacted so that associations can properly invoice all owners for assessments. In addition, AB 2273 shortens the time for foreclosing parties to notify associations that they are the new owners. However, in order to take advantage of this aspect of the new law, associations will have to have recorded a “Request for Notification” prior to the property receiving a notice of default. Where an association has recorded a “Request for Notification,” the foreclosing party must notify the association within 15 days after the date of sale. All California community associations should contact their legal counsel to make sure that a proper “Request for Notification” has been recorded so that the association can receive the benefits that the new law provides. This will greatly help to ensure that associations receive notice of foreclosure, and the identity of the new owner, as soon as possible so that assessments can be charged to the proper party. Congratulations to CAI, who sponsored the bill, and worked hard to get it passed for the benefit of all California community associations! 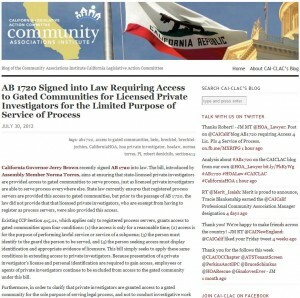 I recently submitted a guest post on the CAI California Legislative Action Committee (CLAC) blog regarding AB 1720, and the new requirment it imposes on California gated communities to provide access to licensed private investigators for the limited purpose of effecting service of process. You can read the post and the analysis of the impact of AB 1720 here.